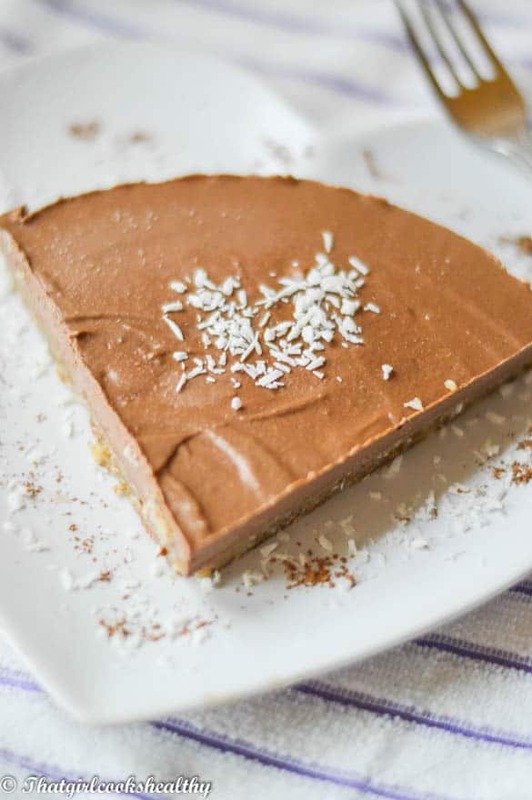 No bake chocolate cheesecake recipe – this raw version of chocolate cheesecake is made from cacao with an almond biscuit base, totally foolproof dessert. 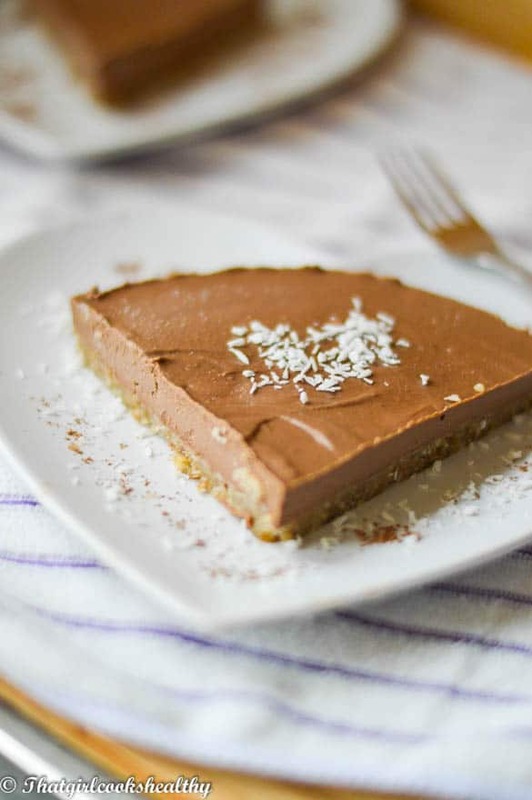 I first discovered this no bake chocolate cheesecake recipe on Megan’s (Detoxinista) website. I followed her recipe from scratch and what I loved about her version was the fact that she incorporated a zucchini (courgette) as part of the filling. This was an unique approach to raw cheesecakes, maybe she wasn’t the pioneer of such ingenuity, but regardless of whomever thought of this concept – I would like to thank you as the results were divine. 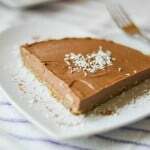 My no bake vegan chocolate cheesecake recipe follows the same ingredients as Megan’s with an exception to the base. I adapted my own signature style, using coconut and almonds instead of walnuts to form the base and omitted the chocolate. I told my co-worker about my cheesecake as she is trying to lead a more healthier lifestyle. I certainly don’t impose my beliefs onto others and leave people to make their own autonomous decision about what they choose to eat. Anyway, she quickly became intrigued and asked me to bring a sample into work the next day. The next day I brought a small helping for her to try and I kid you not she loved it to the extent to where, she had asked me nicely to make a large one for myself and family – I’ll get around to doing that soon. I find that the creaminess of the cashews and softness from the zucchini creates a velvet smooth texture. The addition of a vegetable is a brilliant way to get non-vegetable lovers to eat their veggies plus it optimises healthy properties. Another thing I should mention, which is very important, is storage. The coconut oil in the filling is a semi solid oil which acts as a stabiliser, at room temperature it begins to liquefy. As a consequence of this I would suggest keeping the cheesecake in the freezer or some where cool like the refrigerator. Using a food processor with an S blade, grind the almonds into a fine meal. Add the remaining ingredients to the almond meal and pulse, you should be left with a slightly moist pliable dough. This will serve as the base of your cheesecake. Line the bottom of a baking tin with parchment paper and press the crust ingredients down firmly. Set aside and put the tin in the freezer. Pulse the cashew nuts into a fine meal on high speed. Slowly add the zucchini, nutmeg, coconut nectar, cacao powder and pink salt to the food processor. Process until creamy consistency is formed. Lastly, add the coconut oil and blend until all ingredients are fully combined. Remove the baking tin from the freezer and pour the filling onto the base. Leave to freeze for at least 8 hours or until firm. Wow that looks absolutely delicious!! Thanks Amy, please do and let me know how it turns out. Well…my favorite desert in the world is Cheesecake. So, you certainly hit the spot with this one! I haven’t tried this recipe yet, however, it shall not be long before I do and I will let you know what I think. Going by the picture and the recipe, I just know i’m not in for disappointment. This recipe sounds really good and I’d like to try it since I need grain-free and dairy-free. However, the filling ingredients list seems to be missing some information. What unit of measure for these two ingredients…cup, teaspoon, or tablespoon? Apologies. I shall amend, it should be cups for both ingredients. Thanks for pointing that out.